As Australia’s leading supplier of branded products, Prime Promotional Products brings over 30 years of industry experience to the table. With a large range of promotional umbrella styles to choose from, we will brand your umbrellas to increase recognition of your company and stand out in crowds of people, every time. 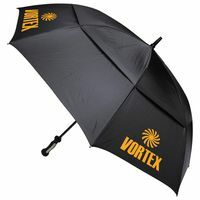 Handing out branded products will bring tremendous recognition for your company — and printed umbrellas are no exception. Not only are they visually appealing but incredibly functional, custom umbrellas can help establish a strong brand that clearly differentiates you from your competitors. Large Printing Area Ensures High Visibility Promotional umbrellas, guarantee large printing areas for your brand, which ensures high visibility all the time. We offer a number of printing options that lets you customise one, two, or even four panels of the umbrella with your logo printed from 1 to 4 colours (even full colour CMYK). Enjoy full 360-degree advertising with our high-quality custom umbrellas. Explore our catalogue for more information on custom umbrella printing, or contact our team of experts to discuss today! 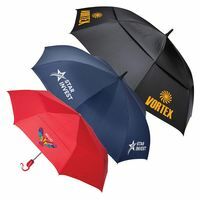 Many businesses use umbrellas to promote their business as they are used frequently within the corporate realm and can easily help spread your business name, logo and advertising message. Also, the functionality of rain umbrellas is a key factor to their usefulness as they are used whenever it rains or even for uv protection from the harsh Australian sun. In-House Printing for Superior Quality Umbrella Logos applied in-house by Prime Promotional Products, giving us complete 100% quality control for every single umbrella that we customise. We utilise a printing technique called screen printing, which provides unmatched precision as well as a beautiful design that will not fade over time. Logos can also be printed in full colour (cmyk) so that your advertising message will never be missed and will perfectly match your website, catalogues and brochures. We are genuinely committed to delivering outstanding customer service each and every time. Our promotional umbrellas come with a 12-month quality guarantee, low-price guarantee, and 100% customer happiness guarantee, so you can trust us to supply top quality promotional umbrellas — every time. Explore our large range of in-stock custom printed umbrellas and start building your brand’s credibility today! 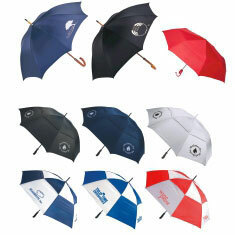 Increase your company’s exposure today with great promotional umbrellas, branded with your corporate logo or message. 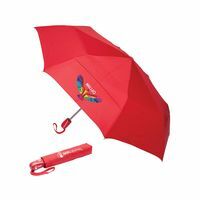 The simplicity and convenience of an umbrella makes them a widely popular promotional gift idea. Perfect for trade show giveaways, Christmas gifts and general promotions. Our promotional umbrellas are perceived as both a generous and practical gift. Our branded umbrellas come in an in a wide-variety of colors and are all easily printed with your logo or message. 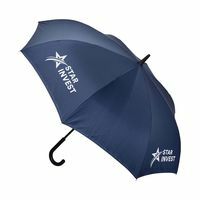 Our range of quality promotional and corporate umbrellas includes golf umbrellas, fold-up umbrellas, executive umbrellas,travel umbrellas and other types of umbrellas. Browse and order our range of corporate umbrellas online or contact us today to discuss your specific promotional umbrella needs.